I visited the Seattle boat show this year and happened to find myself on a raider 2484 and I was pleasantly suprised to find that it seemed perfectly proportioned, to me, to be the fishing/adventure boat that I have been looking for. I fish in the Port Townsend, Sekiu and Neah Bay areas and have aspirations to adventure and fish up in Destruction Sound and off the west coast of Vancouver Island. Right now I own a 20' bayliner trophy and would like to upgrade to a raider 2484 or 2494 cuddy, but I have a few concerns. According to their website the 2484 cuddy weights in about the same as my trophy does, the 2494 looks to be about 600lbs heavier - dry weight, and my concern is that the raider will beat me up while running and be as unstable on drift as my trophy is due to their weight being about the same. By unstable I mean rocking like a hurricane when I am hit by a 1 foot boat wake or corking like crazy when I am in small to medium swells out at swiftsure. I often ride in my buddies 22 foot glasply, around 6000 lbs, and find that to be super stable at drift but a bit poundy when running into head seas, in comparison to my trophy. I know that there are other factors than weight that determine ride and stability at drift and I have read some excellent posts on the subject here, but I would appreciate any feedback on the stability of the boat at drift and the quality or smoothness of the ride from raider owners. Heck, I would be even happier to cover gas/beer if any raider owners in the Puget sound area would be willing to take me out on the water to see for myself. We got a 24 foot riverhawk alloy boat a year ago--so it is somewhat similar to the raider--perhaps slightly heavier. Our previous boat was a 21 arima and the riverhawk was a big step up for us. I think you would be happy with a 24 alloy--compared to your current 20 footer. you are welcome to PM me if you have specific questions. The Raider is a light boat for it's size so expect to get blown around a bit and feel some pounding. The price is attractive but if you pay a bit more to get more metal and more deadrise some of the concerns you have voiced above will be less of an issue. Make sure to double clamp the hose connections that are below the waterline, add some heat shrink to the wiring connections, remove all of the screws and apply tefgel, then put some sacrificial anodes on it. Those were some of the issues the boat came with. I picked up a 2684 for a steal at the boat show in 07. That was before I knew anything about aluminum boats. The 2684 pictured on their website was my old boat. I spent a few months learning about alloy boats after placing the order and sold the boat right after I took delivery. Luckily, all it cost me was the drive to the dealer in Ellensburg. I don't know how much has changed in 9 years, but I don't think the boat I bought, would have held up for long. At the time, it was a 65k boat, so there was a reason it was half the price of a "commercial grade" boat. Wow, that is a lot to think about considering the raider has a 'great' price point of 80K ish! I don't own that boat, but my guess is the ride will be a bigger issue than the stability. I mostly fly fish and have a 23' raider center console (8.5' beam) built on their 2100 PRO SPORT hull and stability has not been an issue (I've had it out at Neah / Westport / Nookta in the ocean in decent swells), but the ride is not good in any significant chop. I generally have to keep it under 20 mph in choppy conditions or the ride becomes unbearable. I've had it 3 years and the only issue I've had with the boat so far is the dreaded mill scale flowering that developed after one year of use in the salt that I spent 3 days addressing 2 years ago. I have a lot of hours on the boat and overall, I've been happy with it and have even managed to do 5 tuna trips. Thanks for your responses, the info gives me lots to think about including looking at the Kingfisher Coastal Express boats as another possibility. Curious that it is really difficult to find either the Raider 24 cuddy or the Kingfisher Coastal Express used anywhere. Makes me think owners buy em and keep em forever. I own this boat..still getting dialed in since picking it up in Oct. Did A LOT of research over the last 5 years...I have some threads started on other boards and you can find me on FB LazyCoho. BrickShouse, drooling over the pics of your boat, love the no paint option! I would love to hear your take on how she handles in rough water and how stable she is at drift. The Raider Weights on the website are way off. Last I spoke with Mike he's working on updating everything. I've personally ran the 2484 and the 2496 the 2496 is a beast and a lot more stable and beamy but it comes with a price tag. The 2484 is a great boat for what you're doing, Mike builds the substructure a lot more stout than most of the other production manufactures. harcher wrote: BrickShouse, drooling over the pics of your boat, love the no paint option! I would love to hear your take on how she handles in rough water and how stable she is at drift. Thanks, I went no decals on the hull but there is paint on the upper part of the boat. They would not let it leave the shop without paint. (I would guess this is because of quality of welds/detail/corrosion concerns) I can only speak about stability coming from a 16ft Hewes sportsman..it 100x better. As for rough water I haven't had it in anything worse then 1-2ft wind chop. Halibut opens May 7th and I may see some weather then. You really need to know what you want to use the boat for, how much money you have and understand that you can't get it all. You will sacrifice one thing for another. I can tell you why I choose Raider boats and the 2484. 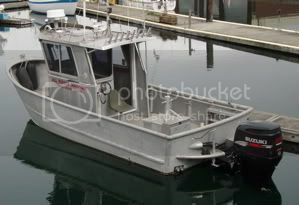 I will use my boat in the Puget Sound, north to Vancouver Island and south east Alaska. 90% of its life will be inside waters with the possibility of a few trips out of Neah. I needed to be able to launch and retrieve it by myself since my crew consists of a 3 and 5 year old and my wife. Beaching the boat is important to me so it needed to be light. It will not be moored 90% of its life so I need it to trailer well. I wanted to be able to tow it easy and cheap. I beat the crap out of things I own and this boat is a tool for me, so all the "plush" upgrades and such is something I am not into. Its a light boat on a hull similar to Hewes Ocean Pro. It will not compare to larger/heavier aluminum boats 4-5k heavier. If you compare it to the same aluminum boats in its class its as light as Wooldridge pilothouses and preforms similar. I am getting 6.8-7gph running 20-21 MPH @ 3700-3800RPM with Honda 250. In quality it compares to Hewes offerings at 30k less price difference. The new 2496 is going to be more stable but you now have to trailer this boat with wide load markers. Which makes me not interested and if I was going to go with a 2496 and mooring it I would go bigger. Again it comes down to what you want to do with your boat. Last edited by BrickShouse on Thu Apr 14, 2016 2:48 pm, edited 6 times in total. WestwardOne wrote: The Raider Weights on the website are way off. Last I spoke with Mike he's working on updating everything. I've personally ran the 2484 and the 2496 the 2496 is a beast and a lot more stable and beamy but it comes with a price tag. The 2484 is a great boat for what you're doing, Mike builds the substructure a lot more stout than most of the other production manufactures. I was told my dry weight was 3350 lbs. This is also what they have on the new website.